Ireland's bid for a non-permanent seat at the UN Security Council is not a "vanity" project, the Taoiseach has insisted. Mr Varadkar was in New York yesterday as the Government formally made the case to take a seat on the UN's most influential body for the two-year period from 2021 to 2022. He was joined by Bono, former President Mary Robinson and Tánaiste Simon Coveney. "The UN is an important place where important decisions are made," he said. "It's where decisions are made on sanctions and even on occasion where decisions are made on whether or not the world should go to war, so there is no vanity here, this is serious stuff," he said. Mr Varadkar defended the significant diplomatic resources being deployed by the Government to achieve the bid, saying that it augmented Ireland's need to become a more open, global island after Brexit. "It's very much about Ireland seeing itself as a country at the centre of the world; when it comes to foreign policy, we need to prepare for Ireland post-Brexit", he said. On Sunday night, U2 hosted 152 UN ambassadors at their cost at Madison Square Garden. During the concert, frontman Bono expressed anger at the policies of President Trump. The separation of children at the US border, the decision to leave the UN Human Rights Council and Mr Trump's tacit support for neo-Nazis during the Charlottesville riots in the US were all targets for mention in the show. Bono compared Ireland's plight as a nation of immigrants to those being incarcerated in US prisons for trying to move to America. "We are proud of our island of Ireland. They work very hard to protect our borderless island. Are we up for a borderless island here?" he added. 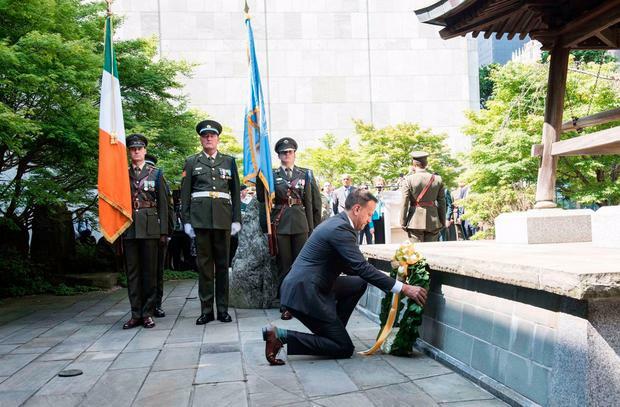 He called to the UN ambassadors who were there at Ireland's invitation and thanked the UN for its peacekeeping missions, and for keeping the world "more peaceful". US ambassador to the UN Nikki Haley did not attend, but the US was represented at the gig, the Irish mission to the UN confirmed. Last night, Mr Varadkar addressed the 192 ambassadors from each UN member state, all of whom have one vote each and who will decide among Canada, Ireland and Norway for two seats. All three countries are regarded for their commitment to the UN institutions, and for development aid and reform of the UN. Ms Robinson said winning the seat would be "most difficult" given the competition. But she said that the State's history as a former colony which fought for independence and its peacekeeping efforts were key assets that set Ireland apart. However, she admitted that the "Security Council has been failing us" over Syria, as well as the "abuse" of the veto system from the five permanent members which paralyses action by the international community in times of war, human rights abuse and occupation".